Quite abruptly, my father decided that my mom, my sister, and I come with him to his Jakarta trip. It’s not unusual for me to go to Jakarta. I have been going there ever since I was only a year old. Back then, we’d go there by car, consuming almost 24 hours to reach the destination. No wonder I’d go there often, my mom is from Jakarta; she was born there and her side of the family still lives there. The plane ride, both coming and going, was nauseating for me. The takeoff and landing was very bumpy and there were a lot of turbulences in the air. 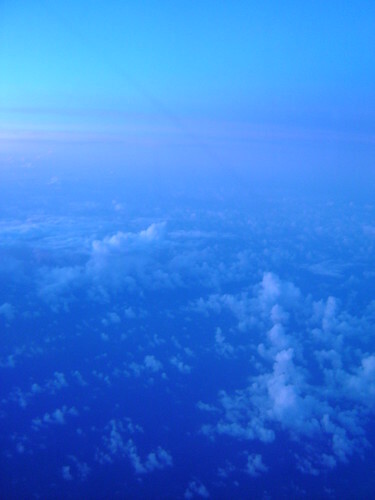 That kind of flight made me feeling green and blue. Even though I’ve been to Jakarta often, by no means I know every twist and turn of the streets. We’d always use a chauffeur and sleep most of the time in the car, bored with the increasing traffic jam. The only places familiar to us are the huge shopping malls like Mall Taman Anggrek [MTA], Plaza Senayan [PS], Plaza Indonesia [PI], Puri Indah Mall, Mall Kelapa Gading [MKG], and many more. However, we do go to a sort of market called Pasar Baru [“Passer Baroe” was the old name; it literally translates into “New Market”]. It’s like a long paved road with small shops on the sides. There is an underground market as well where they sell “jajan pasar” [street snacks], traditional foods, and some dried stuff [such as all kinds of crackers, noodle, etc]. Also often visited is the hospital where my grandpa used to and still does work at age 91 [this November]. It’s called “Rumah Sakit Husada” [“Rumah sakit” means hospital]. I can proudly say that my grandpa is a Dutch-educated doctor; educated in the Dutch school during the Dutch colony. He can still speak Dutch until now, it was especially used in the conversation with my grandma; who passed away 2 years ago. My grandpa is a hardworking man and well-respected. He still got an office at the hospital and goes there twice a week. Now, let’s talk about the foods I encountered while in Jakarta…. I must have forgotten to mention that I like to go to the market in Jakarta too. Since it’s located in a residence area, it’s cleaner and neater. I like to go there in the morning to buy breakfast. Most often, we are having “Bakmi Ayam” [Chicken noodle], which is boiled noodle with shredded chicken and vegetables and served with chicken broth. It depends on people’s preference whether they like their noodle swimming in the broth or just eat it plainly with hot chili sauce. 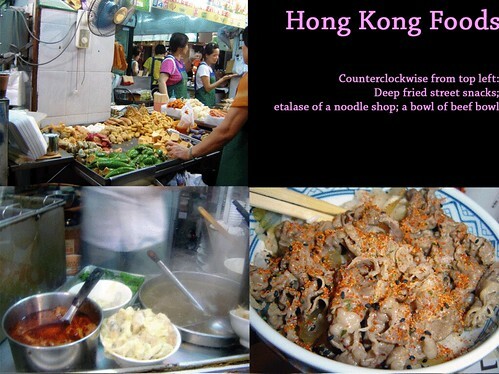 The noodle is chewy and elastic, it’s usually splashed with a mixture of condiments [soy sauce, sesame oil, fish sauce, salt and sugar]. Along with the noodle, we usually buy some “jajan pasar” as well. 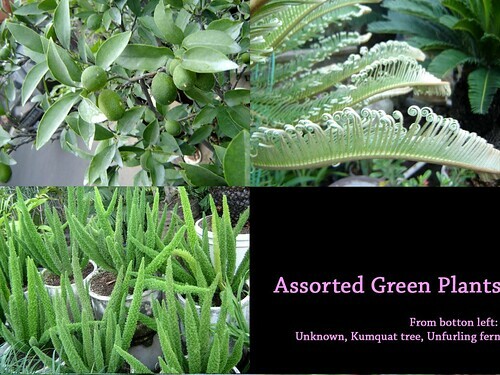 The variety is countless! 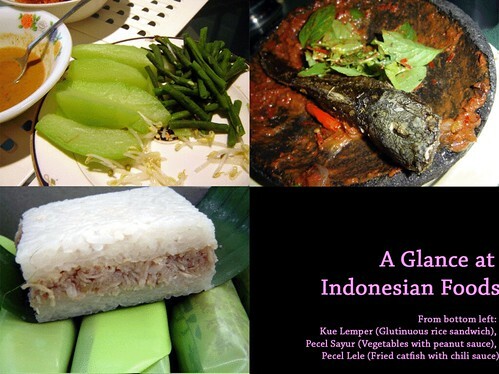 In the picture, you can see “kue pepe” [in the picture] which is layers of steamed cake made of glutinuous rice flour. There are two flavors sold in the market, “pandan” and chocolate. This is my mom’s favorite snack when she was a little girl. 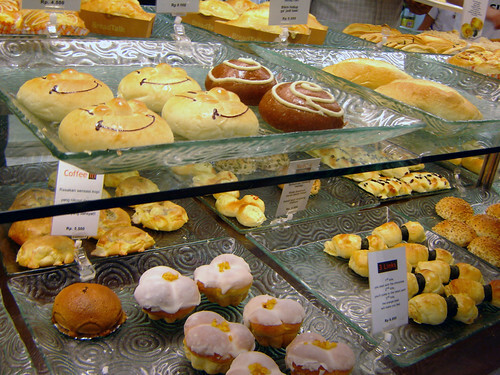 They also have “gemblong”, “combro”, “bolu kukus”, “talam ubi”, “nagasari”, and many many more! Each one can’t be translated literally and must be given long explanations. When you’re shopping for street snacks in markets in Jakarta, just ask for those foods I mentioned. In Sogo Department Store, there is a food court specializing in foods from around Indonesia [mainly in Java] called Spice Garden. 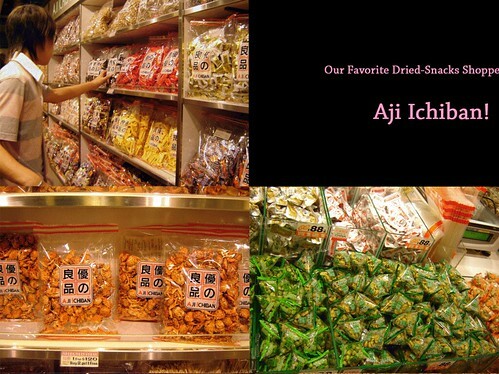 They also sell traditional drinks, and Japanese and Chinese foods. 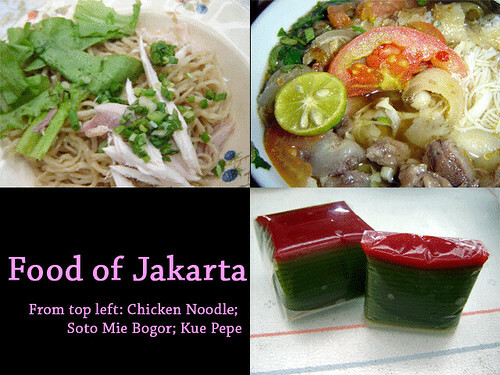 I’ve tried their “Soto Betawi”, “Mie Jogja” [Jogja Noodle], and Coto Makassar. This time, I’m going to try “Soto Mie Bogor”. It’s basically a yellow soup with rice vermicelli, beef, brisket, “risol” [fried square wonton”], and vegetables. It’s ready to eat after some “jeruk limo” [small limes] juice is squirted and some sweet soy sauce is poured over. 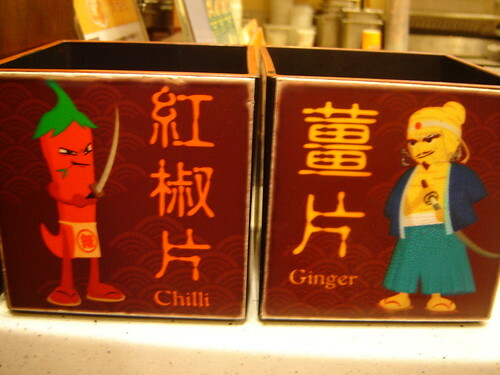 To add more challenge, people will spoon in a lot of chili sauce [“sambal”]. Actually, I came across this food when Mr. W bought it for me in Bogor, a city outside Jakarta. But, it didn’t taste good at all back then, so I wanted to try it again at a more decent place because he keeps boasting how good it is. 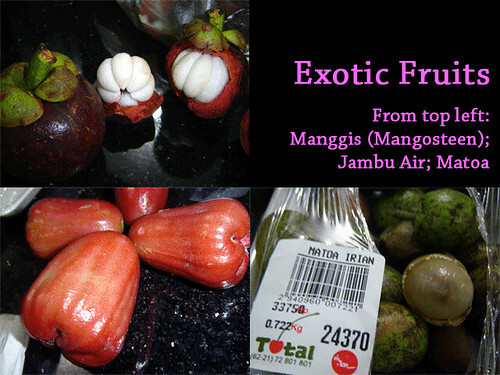 I realized that there are a lot of common fruits in Indonesia that can’t be easily found in Canada. I don’t think I’ve seen either mangosteen [“manggis" in Indonesian] or “matoa” in Canada. My father once bought the “jambu air” from a Chinese grocery in Markham. I heard that you can find mangosteen in Pusateris, but I’ve never been there myself. While “matoa”, I don’t think you can find it anywhere else since it’s cultivated in Irian Jaya [west of Papua New Guinea]. Perhaps when it’s popular enough, it will be mass-cultivated and exported. Its flesh is almost like longan [“kelengkeng” in Indonesian]. Some things have changed in just one year. Little things, really. Maybe this transition from cool weather [or “pediding” in Indonesian] to hot and humid weather is making me more short-tempered; meaning easily get upset. But, based on my observation, I have been feeling this change before the weather change. It’s the change in the way people trust one another. I look around, and all I see I that trust towards another human being has decreased, as seen in the increased amount of security. This is most notably in places like grocery stores, supermarket, and stores selling household equipments. One example is when I visited Bali Deli in Jakarta, the security warned me not to take picture. Afterward, she would pry her eyes on every movement I made in that foreign-owned supermarket. It’s very uncomforting knowing how the increased security implies that the morale of this nation is on the lower side. Increased security illustrates that more shoplifting have been found, more crimes have been conducted. At least, that’s what I would think. Also happened just yesterday. When we went to this baking equipment shop, we were asked even to check in our handbags at the front counter! It’s only handbags where we keep our valuables! Yet, they insisted! How do they expect me to do a smooth shopping if I had to carry my cell, bulky purse, and camera on my hands? Then, I just asked the counter guy casually if there had been more robberies lately and he just smiled dryly. There are still a lot to complain from this obnoxious country but I won’t be too blunt because this is indeed the place where I was born. People here try their best indeed to survive and I have met and known some good people who use purely their own strength to achieve success. Life is bitter, but sometimes spoiled girl like me don’t really feel its direct effect. This recipe I’m about to share features bitter gourd [“pare” in Indonesian] and very simple to prepare. Rumor says that bitter gourd is useful in cleansing the bowel. Sautee the shallots and green chilies in oil until fragrant. 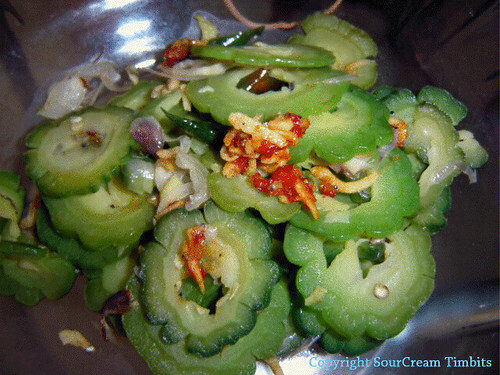 Add the sliced bitter gourd, stir occasionally. Turn off the heat and add the fried anchovies. The first week at home. Week of July 11, 2006. 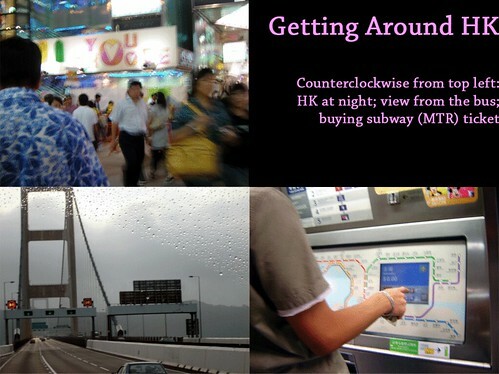 After our brief trip in HongKong, we’re home at last. It’s very relieving to be at home. Surrounded by familiar smells, furniture, and of course my two lovely mongrels. Coming home has its consequences. Since the air in Indonesia is badly polluted [unlike Canada], my nasal allergy is once again triggered after a long absence in Canada. Moreover, smoking in public places is not controlled very well here. People can smoke anywhere they want and anytime they feel like it. Even inside an indoor restaurant! Everytime I walk by an inconsiderate smoker, I would frown my forehead. Perhaps the only smoke-free environments are inside movie theatre and the washroom. Beside the polluted air, I don’t have much complaint about anything else. Traditionally, upon arrival we are to visit our grandparents who live right across the street. They would greet us with a wealth of foods, both Indonesian and Chinese. They did not specially prepare that for us, though. It’s just they are used to having a lot of foods available. Here is a glance at some Indonesian foods found in my grandparents’ house. They are specifically Javanese foods. The first of the three is called “Kue Lemper” in Indonesian. It is one of hundreds of traditional street snacks wrapped in banana leaf. The savoury sandwich is made of glutinuous rice boiled in rich coconut milk. Once the blocks of glutinuous rice are made, some shredded chicken is stuffed in the middle, similar to a sandwich. However, due to the high content of glutinous rice, this food remains a snack since it’s not good for the digestion to eat glutinuous rice on an empty stomach. They are best eaten on the same day of production because the coconut makes them go bad quickly. Next up is a partially eaten “Pecel Sayur” that can be easily found in any street vendors or small Indonesian restaurants. There is one popular “warung” [food sellers on the sidewalk] near my old high-school that only opens in the morning. You can find a lot of people as early as 6am, lining up for the pecel and nasi campur [rice with assorted sides]. The preparation is made easy with the availability of ready-made blocks of peanut sauce. This is no ordinary peanut sauce since it consists of a lot of complicated spices that my tongue can’t detect. After asking my mom, I discovered that the peanut sauce is a mixture of a block of palm sugar [brown sugar], dry-roasted peanuts, lime leaf, kencur [Kaempferia galanga], and chilies for hotness. There is no rule on which vegetable should be included in the platter. We normally put chayote, bean sprouts, long beans, watercress, and kangkoong; all blanched in boiling water for 3-5 minutes. Additional foods that normally goes with this are fried tofu and tempeh, “kemangi” leaves [lemon basil], and flour crackers. All these are eaten with rice. Modest, yet delicious. We ate this “pecel lele” at our favorite restaurant in Pandaan, which is south of my city, Sidoarjo. In a place called “Ayam Goreng Sri”. “Ayam goreng” means fried chicken, and this place is famous for their sweet fried chicken. I was amused by the Kumquat tree. I’ve never tried these orange sunset colored fruits and if anyone knows how they taste like, please do tell me. It was refreshing to see so many greens surrounded by the fresh air of the countryside. There were a lot of interesting fruits that are not available in Canada such as “sirsat” [soursop] and “ketela ubi” [Sorry, but I don’t know the English translation]. Bananas are also presented just like after being cut from the trees. Still clumping together on a long branch. Then, we’ll ask the seller to cut one row for us. I think this is the same variety as the Chiquita bananas available at Canadian grocery stores. Only we call it “pisang Ambon” [Ambonese banana] here. 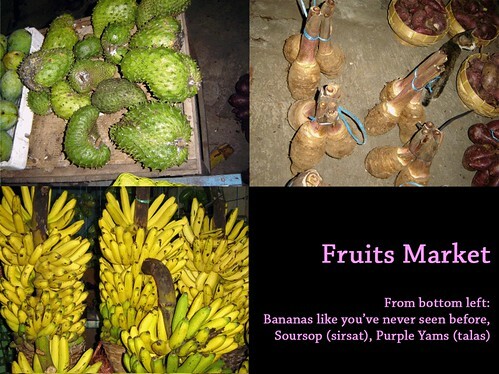 I hope you all enjoy this first post about Indonesian foods and fruits. 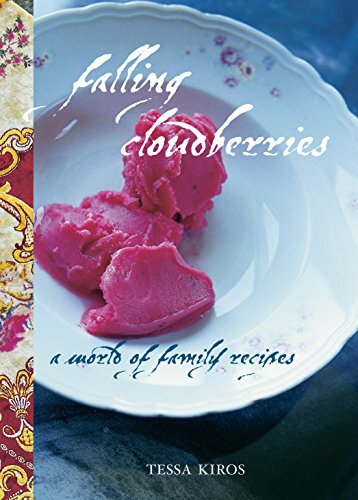 There are still more to come although mostly will be in review-style instead of a step-by-step of a recipe. As you may have noted, I have been absent for the longest time ever.. Perhaps more than 3 weeks. Or, almost a month! During my last week in Canada, when school was already over, I was out celebrating summer almost everyday. One day we went Strawberry Picking, the other we went to try out one Summerlicious restaurant, or simply watched a movie and took a leisure walk at Nathan Philip’s Square. It’s the middle of summer already in Canada and I thought it would be useless to write long posts about events that have been long gone. So, I decided to give a quick flashback over what had happened during my short course of summer in Canada. I have always wanted to do this. I made planning ahead, before the season even began. The difficulty of not owning a car showed up here as no public transportation reaches this suburbia part of southmost town of Markham. Given no other choice, my hard-willed desire helplessly opted to ride a taxi. We could’ve walked… for 6 kilometres! Rather than fainting in the middle of the deserted road, we’d rather be paying for a taxi ride. The strawberry farm wasn’t disappointing at all. 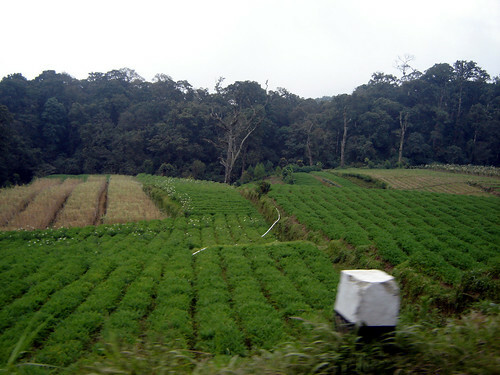 I loved the surroundings and the peacefulness of the hectares of vast land. 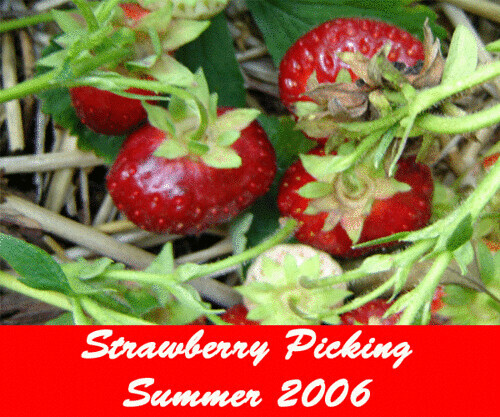 The picking was made especially comfortable by the straws neatly arranged in between the strawberries so that we can lay our buttocks there wile picking. I got too carried away that Mr. W and my sister had to remind me to stop plucking the strawberries. We’d secretly ate some strawberries we just plucked while sitting down. They were oh so juicy and melted in our mouths right away!!! Finally, we ended up with 13.6 pounds of fresh-picked strawberries. 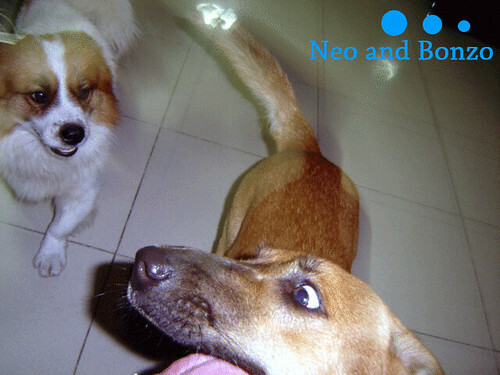 For a complete set of photographs, please visit my Friendster album. It’s a little slow, so I hope you could bear with it. Summer won’t be complete without Summerlicious. This unique fix prix event, where a bunch of renowned restaurants participate, owned only by Toronto. The first restaurant that came to my mind was Pangaea. I’m not sure why, but I guess it’s mainly because of the reviews I read in the past about this simple and spacious restaurant. 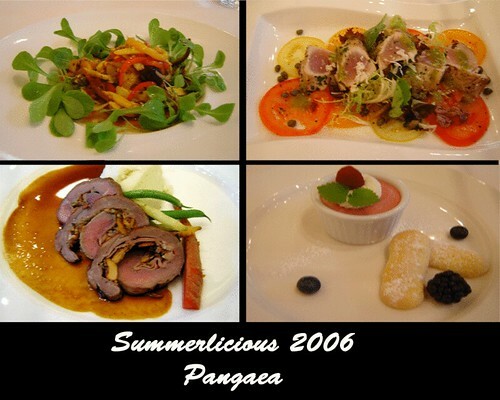 The dishes they presented all have distinguished taste, simplicity in presentation, and free of any pretentiousness. The appetizer that I ordered was the octopus salad, citrusy and refreshing. The main course of choice was a seared tuna, which I’ve never had before. Being an open-mined eater and a lover of sashimi, I quickly fell in love with this juicy tuna topped with fresh cilantro sauce and grated horseradish. Farewell Tasha, Farewell Husky, See you soon Toronto! 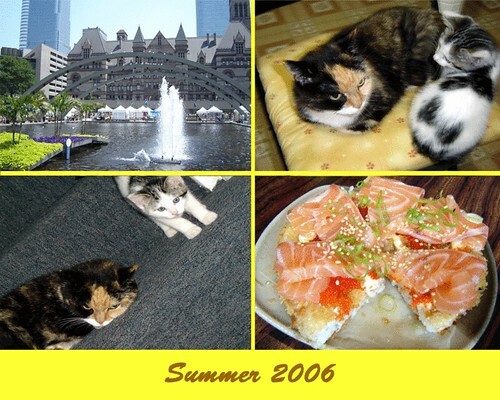 Clockwise: Nathan Philip's Square in the summer; Tasha and Husky finally getting along; Sushi Pizza at Sushi Time, Queen Street West; So long Tasha and Husky! This entry in itself, would already indicate that I am no longer in Toronto, temporarily. In fact, I am writing this entry in the heat of the night at my home in Sidoarjo! Yes, I have flown back from Toronto to my home country, Indonesia! After overcoming the jetlag and expected sickness, I hopped to the keyboard. Too excited to share the findings that I got during my first week at home. Just watch out for it!